Our books on Webmin & Virtual are available now on Amazon. Click on the book images below to visit the Amazon store. 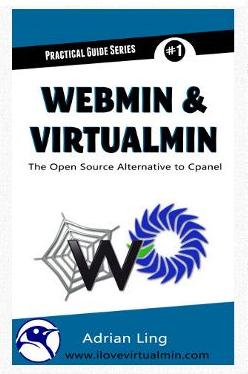 Webmin & Virtual is the best Open Source Alternative to Cpanel. Naturally, I’m bias in this statement of course, but this software has stood the test of time – the first release was waaayy back on the 5th October 1997. Today, it IS still being actively maintained and new features added. For example, version 1.710 was released on 29th September 2014 and addressed critical bugs such as the Shellshock bug as well as adding support for iSCSI configuration on CentOS and RHEL6. No other open-source control panel comes this close – as far as I know. It is also packed with lots of powerful features (not found in some of the more popular commercial control panels) such as the ability to create custom server templates for the virtual hosts. 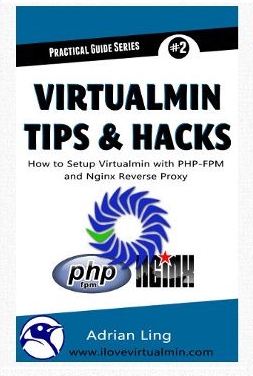 How to setup, integrate and automate PHP-FPM & Nginx Reverse Proxy in Virtualmin. Running PHP-FPM under its own userID has been a long running topic among the users of Virtualmin. Automating this task and integrating it into Virtualmin is one of feature frequently requested by the community – but it is still in the long ‘todo list’ of the developers. This book shows you how to automate and integrate PHP-FPM into Virtual via the standard hooks provided by Virtualmin and a bunch of custom scripts that I’ve developed. Once you’ve set this up, you won’t have to manually edit configuration files anymore. BONUS: Included in the book purchase is a set of custom developed shell scripts to set up the various configuration files – httpd.conf, php-fpm pool configuration files, nginx site configuration files, etc. You just need to run the script and answer a few questions on the command line.